﻿ How to Show Value to Your Clients Through Digital Marketing Measurement » Red Mango Marketing! When it comes to measuring digital marketing, it’s important to remember that your small business clients only care about the impact your actions are having on their business. Overburdening them with leading indicators such as likes, shares, and followers should never be your end goal. It should always be clear how these metrics are leading to a business result. Otherwise, you may be doing more harm than good. Here are some things to think about to show the value of your work through measurement. Think about creating a goal-driven measurement framework, starting with a single business objective at the top. When you have an agreed on business goal, such as a confirmed sale or lead, you can then work backward from there. What did the customer do before giving your client money? And what did they do before that? Keep asking to discover the path of the customer. Working backward enables you to show the individual paths taken and decide on the best ways of measuring them. Do different types of clients need different measurement strategies? Keep in mind that a B2B client may be after leads and sales and a B2C may be more focused on awareness and engagement. The digital channels you use as part of your strategy for each client may be similar. It’s how you present the results of your efforts that will differ based on the individual goal of each client. There’s no question that it’s important to measure your marketing activities, but without knowing the business impact you’re providing, it’s tough to evaluate which marketing activities are working best and for the client to feel confident in the services you provide. Look for ways to track the whole pipeline so you can understand and show things like sales growth, cost per lead, cost per customer, and what products or services are selling best as a result of your efforts. Keep in mind that as you add new channels to the mix, you run the risk of polluting your data. One option is to phase in your activities on each channel separately, so you can measure the impact of each channel as it comes online. Different channels play different roles, and you don’t want to discount a channel that may be supporting another. Multi-channel campaigns call for a different measurement strategy than when working with one channel. Use a report like Top Conversion Paths in Google Analytics to help visualize how your marketing channels work together. Once you have agreed on a business goal, then you can decide what marketing channels the client might plan to engage in — such as email marketing, social media, SEO or PPC — allowing you to identify the key metrics for each channel. The main criteria are that you should have the capacity to measure the outcomes and ultimately, the impact on the business with some degree of accuracy. 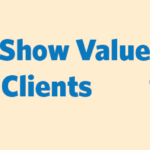 What are some of your tips for showing the value of your work to clients? Learn about our Solution Provider Program here. The post How to Show Value to Your Clients Through Digital Marketing Measurement appeared first on Constant Contact Blogs. This entry was posted on Thursday, September 28th, 2017 at 8:00 am	and is filed under digital marketing measurement, News & Updates, Online Marketing, Solution Providers. You can follow any responses to this entry through the RSS 2.0 feed. Both comments and pings are currently closed.